NEW YORK – Serena Williams has a great chance to sweep to victory at Wimbledon and hold all four grand slam titles at the same time but she must raise her consistency, former champions Chris Evert and John McEnroe said on Thursday. Williams is one Wimbledon title away from completing what she calls the Serena Slam for the second time in her career — having followed up her 2014 U.S. Open success with victories at this year’s Australian and French Opens — but must overcome her recent lean spell on grass. After winning the last of her five Wimbledon titles in 2012, the American world number one has fallen before the quarter-finals in her last two outings at the grasscourt major. 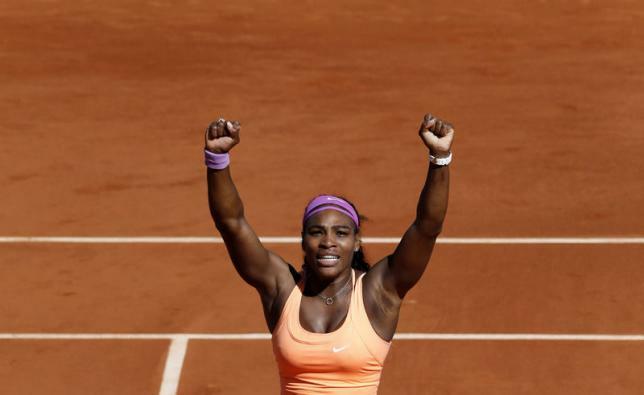 “I think Serena’s got a great shot,” Evert, winner of 18 grand slam singles, said on a conference call arranged by ESPN. Three-times Wimbledon champion McEnroe said it was there for the taking for Williams, who is bidding to win her 21st grand slam singles title. The American commentators agreed that the lapses of concentration that hampered her at Roland Garros could prove more costly at the All England Club. Williams battled flu during the second week of her run at Roland Garros, where she survived five three-set battles to win the title, beating Lucie Safarova in the final. “On grass, a couple bigger hitters … (could) win more points on the serve than they would on a clay court or a hard court,” McEnroe said.